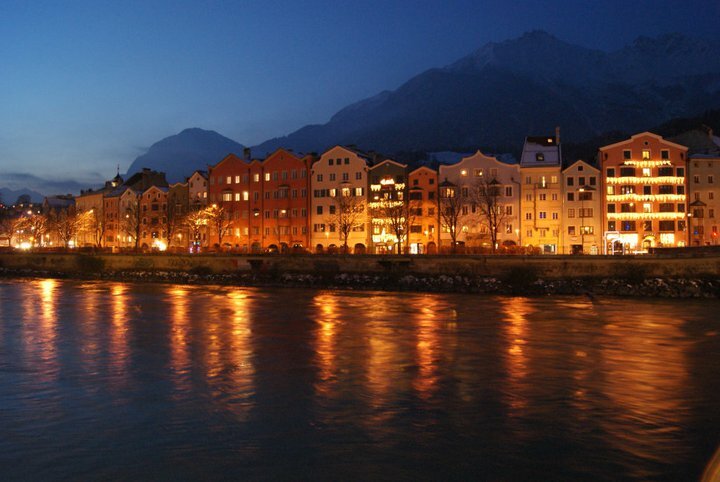 Icy summits surrounding the city, mint blue torrent flowing through the valley – Innsbruck. Sometimes the fog mists the picture up, plunging every single soul in a supernatural atmosphere… Somewhere behind the clouds, dark walls guard them from any danger. 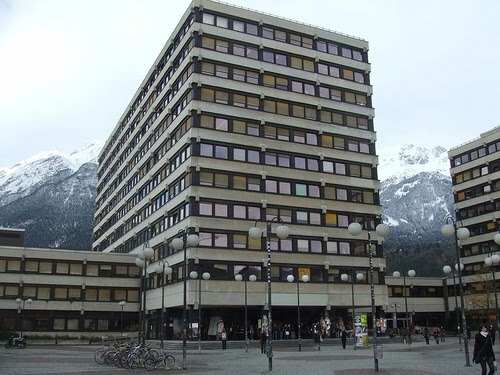 Following the way down through the botanical garden, turning left, going down the secret path full of the sound of the building site some yards below, crossing the street, crossing the bridge, your steps have led you at the foot of the Leopold-Franzen-Universität Innsbruck, Austria. A pair of grey towers of the ancient modern style with yellow blinds. Everybody gets up. You leave without saying goodbye to the others. You don’t know them anyway. Planning the rest of your day, you are torn between the call of the mountains and the cry of the literary texts waiting to be read. As the cry can be more easily ignored, you tie up your good shoes and climb up the “hills”. Higher and higher, steeper and steeper. Your effort is worthwhile. A juicy apple overhanging the city. A cake to bake calls you down and a bit of homework puts your mind at rest. You jump into your sport outfit and then, into the bus driving to the Uni-Sportstätten. ‘Clap your hands, clap your hands’. Your rock’n’roll professor speaks with a delicious Austrian accent that is sometimes quite incomprehensible but as long as you understand Kick – Rück – Platz, you are safe. The evening goes on in a pub with some Erasmus students or at the Erasmus international dinner, with Americans at the Stammtisch of the Galway bay or at the theatre. You are spoilt for choice. Before Christmas, the best place to meet and warm up is the Christkindlmarkt, right in the heart of the old town. The aroma of Glühwein mingles with the yellow lights on the colourful facades. You feel a bit dizzy but your feet know the way back and your wandering eyes contemplate the opposite bank while crossing the bridge. Behind the illuminated houses, the naked rock of the mountains has turned to impalpable night and the snow hood that the moon dyed fluorescent seems to drift above them. What an enchanted place! The bridge is crossed, the ascent begins. Out of breath and all cheeks in fire, you look up at the windows. There is still light. Your roommates are not yet in bed. First thing to do: get rid of the coat, of the scarf, of the gloves and the hat, of the wool jacket, of the pullover and of one of your T-shirt. Feeling less like a sumo, you sit in the kitchen with two crazy German girls, drink a shot of schnapps or have a cup of tea. Back in your room, do not close the curtains. Lying in your bed, you can see the lights of the city some feet below and the jagged darkness of the summits against the paling sky. 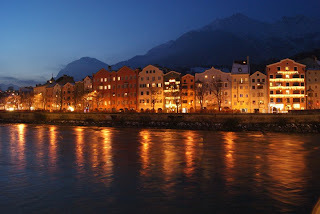 And maybe hear the murmur of the mint blue torrent flowing through the valley – Innsbruck.